On the day of equinox, the sun passes over the Equator and the day and night are of equal length. This is a time when, in the northern hemisphere, the night becomes longer than the day and the seasons are dominated by the moon rather than the sun. Of course, the opposite is true for the southern hemisphere as their summer begins. Throughout history, cultures around the world have celebrated this crossing through many traditions and holidays. It is curious to note that the cultural practices around the world bare striking similarities to one another. One most notable way should, which should not be overlooked, is the building of colossal stone structures that align to the sun marking this important date. Main stream historians dismiss the equinox aligned ancient sites as some sort of coincidence which, when considering the evidence, is truly absurd. On the equinoxes, if we could travel all around the world, we would be able to see this incredible feat of astrological engineering working its magic at numerous ancient stone sites. 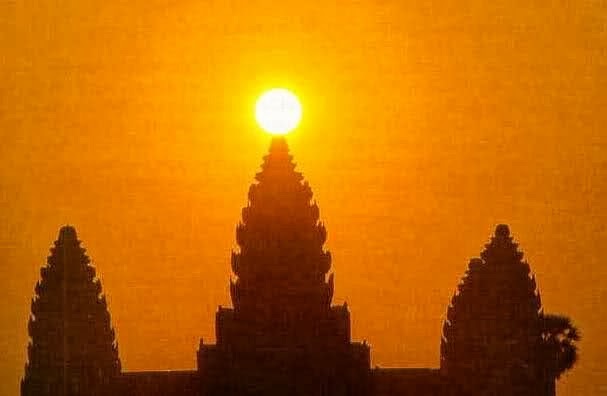 One of the most famous is, Angkor in Cambodia where the sun rises along side the main pyramid spire and gracefully sits atop the tower. Teotihuacan, In Mexico is another pyramid site at which the setting sun “touches” the top of the giant stone structure as it sets on the Equinox. A lesser known structure is in Connecticut in the US called Equinox Calendar Chamber at Gungywamp. This site is home to what is known as the American Stonehenge and on this day, the setting sun will create a beam of light through a tiny window of the ancient stone chamber and illuminate a calendar wall. Other equinox alligned sites include: Chichin Itza in Mexico, Loughcrew in Ireland, The Sphinx and Great Pyramid in Egypt, and Chaco Canyon in New Mexico. There are too many to list here but I encourage you to research these sites on your own. It is clear that ancient people all over the globe found it greatly important to mark the changes of seasons. We would be a bit naive to think that this practice was due to the need to keep track of planting seasons since many of the structures predate agriculture. Rather, the ancients believed that there was a spiritual significance to the connection of humans to the celestial. The transition of the daytime dominated season which brings life and growth into the nighttime dominated one which brings about death and rest, marks the part of the cycle which makes life on this planet possible. It also represents the spiritual path of the soul. It is through the cycle of birth, growth, and death, that rebirth can bring our spirits closer to enlightenment. I live in the low desert of Arizona which means the vernal equinox marks the start of a small time window to grow things before the blistering sun sterilizes the landscape. Here, the summer sun brings death to my plants and the heat of the endless summer keeps me hidden indoors. The autumnal equinox marks yet another growing season as the winters are mild enough for most plants to survive the duration.